When you park your RV at the River’s End Campground, you can not only explore the fabulous beaches but take one or all of the three great tours featured on our site. Voted Best Adventure Tour on Tybee Island for nine straight years, this company offers a variety of worthwhile tours. On the way to the Atlantic, the boast passes Cockspur Lighthouse and provides a scenic view of the Tybee Lighthouse. In addition to the friendly bottle-nosed dolphin, the abundant wildlife you might see includes sea turtles, all manner of birds and who knows what else on this interesting one to one-and-a-half-hour adventure! Sea Kayak Georgia offers paddle sport opportunities to enjoy in the myriad of waterways created by the Atlantic Ocean, rivers and estuaries. You can take kayak, canoe, yoga and SUP journeys suitable for all levels of paddlers. They also offer group tours and instruction for beginners. 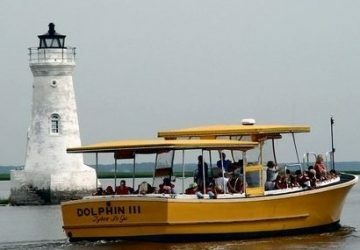 For more than 30 years, Old Town Trolley Tours has provided sightseeing tours highlighting the best attractions in Savannah. You will see the extraordinary architecture, lush botanicals and captivating stories of this historic, coastal city. Other Savannah trolley tour excursions include One and Two-Day Old Town Trolley Tours, Ghosts and Gravestones Tour, Paula Deen Tour, Savannah Day and Night Tour Package, Old Town Trolley and Historic Homes Package, the Old Town Trolley and Maritime Package and more. Note, that discounted trolley tickets can be purchased in River’s End Campground store. As part of you RV vacation to Tybee Island, you know where to go this summer…River’s End Campground! Reserve a full hookup RV site, a primitive campsite or a rustic cabin at our green RV park by visiting our reservation page at www.riversendcampground.com or by calling 800-786-1016.